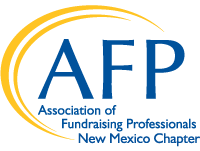 The Association of Fundraising Professionals - New Mexico Chapter (AFP-NM), an association of professionals, advances philanthropy by empowering people and organizations to practice ethical and effective fundraising. The core activities through which the chapter fulfills this mission include education and training, promoting credentialing, providing resources, networking, forging alliances, mentoring, advocacy and recognition. Our members agree to abide by the AFP Code of Ethical Standards. AFP-NM defines diversity as the seeking and achieving of a broad representation of experiences, perspectives, opinions and cultures. AFP-NM has received the 2017 Ten Star Award from AFP International. The Chapter Ten Star Award honors those chapters that have accomplished many of the key objectives outlined in the Strategic Plan. AFP-NM is also one of the 82 AFP chapters that earned the 2017 Friends of Diversity Designation. The Friends of Diversity designation honors chapters that have accomplished key objectives outlined in the advancing diversity strategic goal. This designation encourages chapters to perform activities designed to increase diversity and inclusion within fundraising and public awareness of the importance of philanthropy in all cultures. Chapters were recognized for the Ten Star and Friends of Diversity designations during the Chapter Presidents Council meeting at the AFP International Conference on Fundraising in New Orleans in April 2018.